This article has the goal to improve the awareness about the risks of a pivot attack where the target system is exploited through another compromised system. The classic defense against these type of attacks based on the company’s perimeter is obsolete and it requires new solutions and approaches. The systems are compromised generally by phishing attack forcing the user clicking to malicious url or opening an infected document. 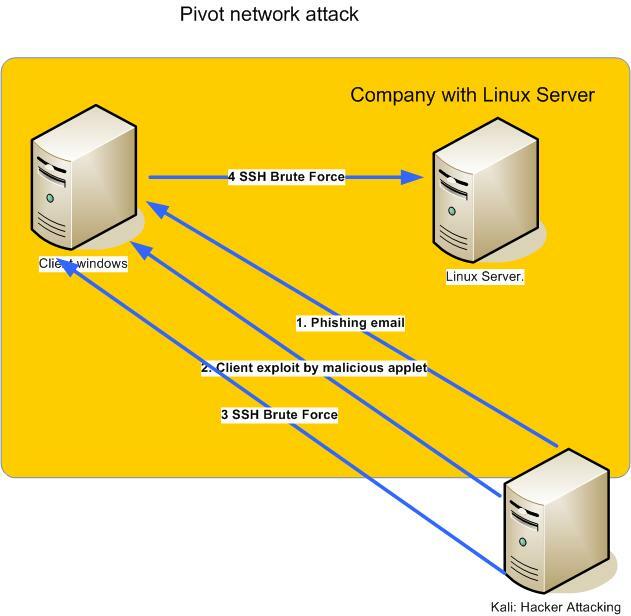 The technique to attack server through another compromised system is called pivoting and it’s showed here using metasploit already installed in Kali Linux. Recent attacks have followed this logic: https://www.us-cert.gov/ncas/alerts/TA17-117A. The example proposed simulates a phishing attack delivering a malicious pdf that permits to take the control of infected system in order to be used as trojan horse for attacking a linux system by a ssh brute force. Let’s start to explain how to organize the attack with Kali. Kali System Operating will be used for attacking the windows client. The metasploit framework already installed in Kali is an exploit tool that contains a lot of well known exploits and shell code, called payload. In this case a PDF file format-based exploit that triggers the vulnerability CVE 2010-2883 is used. This is a stack-based buffer overflow in CoolType.dll in Adobe Reader and Acrobat 9.x before 9.4, and 8.x before 8.2.5 on Windows and Mac OS X: it allows remote attackers to execute arbitrary code (https://cve.mitre.org/cgi-bin/cvename.cgi?name=cve-2010-2883). FILENAME msf.pdf yes The file name. The vulnerability is triggered when the pdf is opened. It executes a reverse tcp shell that creates a connection back to the attacker machine from victim system. The payload is injected directly in the space program of pdf process as dll and executed by thread by a approach called Reflective DLL Injection. The advantage of this solution is not to permit the system operating to register the dll loaded and hiding itself by antivirus checking. For deeping how the meterpreter works, I suggest to read this article https://community.rapid7.com/community/metasploit/blog/2015/03/25/stageless-meterpreter-payloads. OS : Windows 7 (Build 7601, Service Pack 1). The attacker has already taken control of victim system. The privileges of the meterpreter session are that of the user that opened the pdf. If the user belongs to Administrator groups, the privileges are that of Administrator but are limited by admin approval mode (UAC) that helps prevent malware from silently installing without an administrator’s knowledge. For having full controll of the system is needed a privilege escalation that is out of scope of this article. We detected a possibile host to attack with 192.168.3.4 ip address. For detecting the services running on it, we need to perform a nmap and for doing that the windows system exploited should be used as proxy. This type of attack is called pivot. For making a scan of the 192.168.3.4, a route to network 192.168.3.0/24 is added by metasploit. the route below forces the metasploit to route all the traffic to 192.168.3.0/24 to meterpreter session. The windows system works as a simple router. A nmap is done by proxychain for detecting the open port on the 192.168.3.4 system. Proxychain is configured for proxying all the traffic to socks proxy listening on 9050 port. The ssh port is open and it’s enough for a ssh brute force attack by metasploit using the ssh_login module. As user password file is used one of that present in Kali. There were 34 failed login attempts since the last successful login. We exploited the back end linux server. By this approach it’s possible to scan and try to exploit all the back end systems reachable from the first windows exploited. In this article I showed how is possible to exploit the inside company services from a compromised windows system exploited by the preferred vector attack loved by hackers: phishing campaigns. It’s very hard to avoid that the laptops and end company systems are exploited because no one is immune to open to some bad attach of a suspect mail or to visit some infected site apparently clean. The Antivirus always updated does not guarantes a good defense against the modern attack. In this context, it’s necessary to have all the back end servers updated to lastet releases and configured in secure way. In our example the ssh server was not well configured: the ssh root login must be disabled and a fail2ban can be used for avoid ssh brute force login. I hope to help system administrators to have aware about advanced modern attacks and to take the right countermeasures to minimize its impacts.